What is the Home Fire Timeline? 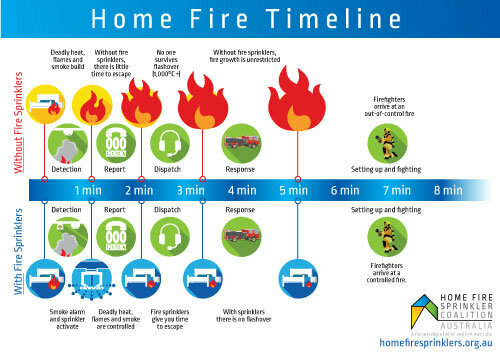 The Home Fire Timeline demonstrates the progress of residential fires from the initial flame through detection to firefighter response. These figures are based on Australian and international research. Smoke alarms will generally detect smoke within 1 minute. Occupants or neighbours will call 000 and notify the fire department within 2 minutes. Taking into account modern building materials and furnishings, fires are reaching flashover in the room of origin within 3 minutes. First responders on average arrive on scene at around 7-8 minutes and begin fighting the fire soon after. Sprinklers closest to the fire will also activate within 1 minute. Fire sprinklers keep the flame from growing and in some cases extinguish the fire altogether. The sprinklers keep the room temperature, flames and toxic smoke to a minimum allowing occupants to escape. First responders on average arrive on scene at around 7-8 minutes and begin fighting the controlled fire soon after in a safer working environment.